Tucson muralist Rock Martinez, left, steps away from the work he is doing on the letter “C” of a greeting card he is painting with Victor Ving, right, in the alley behind Miller Surplus at 406 N. Sixth Ave., on Feb 16, 2017. Traffic on 6th street speeds by the Goddess of Agave mural on the old Tucson Warehouse & Transfer Co., and the current home of Benjamin Supply, at 7th Ave., Friday, March 22, 2019, Tucson, Ariz.
Murals by artist Danny Martin and commissioned by the Why I Love Where I Live brand on the northern wall of Reproductions, Inc., 234 E. 6th St. on Feb. 14, 2018, in Tucson, Ariz. The murals were commissioned for Valentine's Day and the 106th anniversary of Arizona's statehood. A mural by Greetings From... was painted in the alley behind Miller Surplus at 406 N. Sixth Ave., in February 2017 by Victor Ving and his girlfriend, photographer Lisa Beggs. Karlito Miller Espinosa aka Mata Ruda, the artist, teaches an illustration class in the school of art at the University of Arizona. 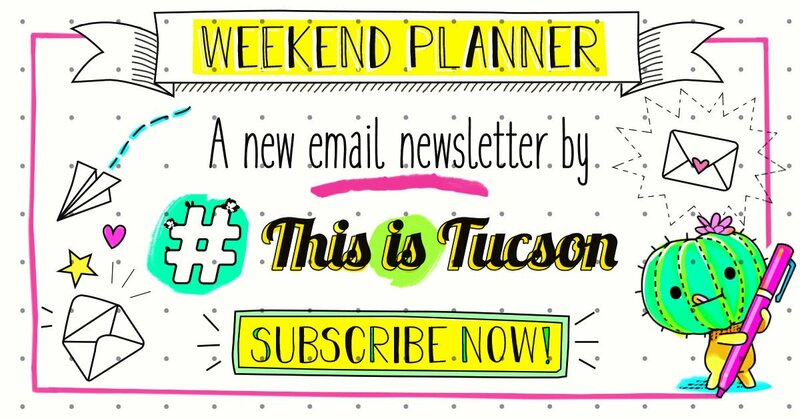 This story was created by #ThisIsTucson and underwritten by Tugo Bike Share, offering 25 percent off memberships this April. Thank you for supporting the local organizations that support us! Tucson loves its murals. And we love the tales behind them even more. Here are some stories the This Is Tucson team has collected over the years about some of our favorite local murals. Bonus: All of these murals are pretty close together so you can take an art tour and look at all of them for yourself. This 40-foot mural on the Benjamin Supply building near downtown became an instant favorite among Tucsonans from the second it was completed in summer of 2016. The "Goddess of Agave" mural was created by artist Rock Martinez, with assistance from artist Christina Perez. It's one of eight original pieces done as part of the Tucson Mural Arts Program. The agave goddess herself, also known as "Mayahuela" in Aztec mythology, is painted in the likeness of Brandi Watkins, Martinez's girlfriend. Martinez, who splits his time between Tucson and Minneapolis, said in an April 2018 interview with This Is Tucson that the agave mural is one of his favorites. "I have lost track of how many murals I have painted, let's just say a lot. My favorite mural I would say is The Mayahuel (Goddess of Agave) mural in Tucson. I have been told that people feel very connected to this piece and that they have said it encompasses the spirit of our Tucson desert. I have been painting this city for over 20 years and I'm honored now to have such a large iconic piece in my hometown." Location: 440 N. 7th Ave. The west side wall of the Benjamin Plumbing Supply building. There's no better way to show love for Arizona than with art everyone can enjoy. To celebrate the state's 106th birthday in 2018, local business Why I Love Where I Live commissioned artist Danny Martin to paint some artwork on the Reproductions, Inc. building near Sixth Street and Sixth Avenue. Kristin Tovar, co-founder of Why I Love Where I Live, said the murals were inspired by her journey toward loving Tucson. The woman in the first mural holding a camera could be seen as Tovar, who began snapping photos of the city as way to find appreciation for the place she was living in. "It's the people who make us love where we live!" Tovar said in a This Is Tucson article. "So in essence, it's a big 'thank you' to the community. The spotlight is rightly on whomever stands in front of her lens." The second mural painted in red shows a lady listening to an album by the Mexican rock band, Los Apson, which is also a reference to the popular taco shop, Tacos Apson, located on 3501 S. 12th Ave. Location: 234 E. 6th St. on the wall of Reproductions, Inc. facing Sixth Street. You can find this mural, which was just recently completed in December 2018, on the east-side wall of the Historic Y building, located on University Boulevard. The mural, titled "Sonora" was created by artist Karlito Miller Espinosa, aka Mata Ruda, who teaches illustration at the University of Arizona's School Of Art. UA students, Analaura Villegas and Brisa Tzintzun, also helped with the project. The mural was painted in a week and features patchwork quilt images that represent the more than 30 non-profit organizations that use the Historic Y. Location: Historic Y building, 300 W. University Blvd. Tucked in the Warehouse Arts District behind the Miller's Surplus building is the bright and brilliant "Greetings from Tucson Mural"
It was created in February 2017 by traveling artists Victor Ving and Lisa Beggs as part of a cross-country mural project called the "Greetings Tour". With the help of local residents, Ving and Beggs painted images reflective of the Tucson culture. This includes a desert sunset, a Sonoran hot dog, Hotel Congress, John Dillinger and the San Xavier Mission. Rock Martinez contributed by adding a skeleton woman to the letter C in TUCSON. Location: 406 N. 6th Ave. On the back wall of Miller's Surplus. Bicycling and murals are some of Tucson's favorite things, so it's no wonder the 4,000-square-foot desert bike mural on Sixth Street and Stone Avenue made the this list as well. Local artist Joe Pagac created this giant mural in the spring of 2017 after he successfully launched a Kickstarter campaign to fund the project. He asked for $18,000 and got $21,616 from 302 people according to a This Is Tucson article. The giant mural features a man, woman, tortoise, javelina and jackrabbit riding bikes — and if you look closely you'll find a hand-painted list of all of the donors who contributed $50 or more to the project. Pagac picked the location of the mural after seeing plans for the Downtown Links project that will connect Barraza-Aviation Parkway to Interstate 10. He has also painted on the back of Borderlands Brewing Company and 191 E. Toole Ave., along the same route. "I started doing private murals originally but would spend the same amount of time in someone's house, and only they would get to enjoy it, but with the public, the whole city gets to enjoy it," Pagac, 36, says. "Nowadays especially, the city landscape in general has gotten gray and beige, so it's really nice to have pops of color around town and things people can look up from their cell phones for 30 seconds to enjoy." This month only, purchase a Tugo Annual Membership and receive a 25 percent discount — an $80 value for only $60. Sign up today and get riding.